CAPP says it sees oil supply growing by 5% over the next 3 years then slowing to a 2% growth rate post-2020. Several major projects are set to be completed this year and begin ramping-up to full production next year, including the Hebron offshore platform, the Fort Hills oil sands mine and CNRL's Horizon Phase 3 expansion. The Alberta oil sands will provide 95% of those additional barrels through the next decade. Production from the oil sands is expected to increase from the current 2.5 million bbl/day to about 3.7 million bbl/day by 2030. Conventional production is expected to hold steady at about 1.2 million bbl/day, including offshore and condensate. CAPP President Tim McMillan says Canada's pipelines are always at full capacity, calling the country's infrastructure network "a freeway that's always in gridlock." Firing back at reports that suggest there are too many approved pipelines on the books, McMillan says the industry needs the Trans Mountain Expansion, Line 3 Replacement, Keystone XL as well as Energy East, which is still in the regulatory review process. 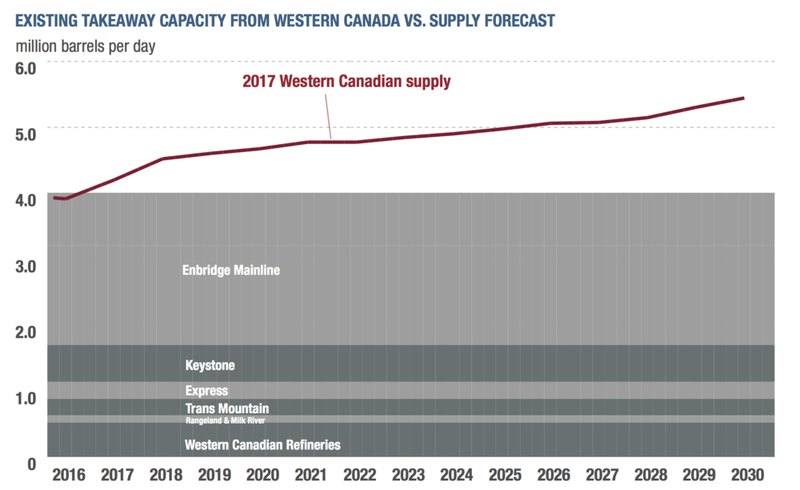 When factoring in diluent volumes, Western Canada will need 5.4 million bbl/day of transportation capacity, significantly higher than the current 4 million bbl/day pipeline network. Excluding Energy East, the three approved pipeline projects will add about 1.7 million bbl/day of additional export capacity. The Gulf Coast remains the most lucrative untapped market for Alberta's crude. Most of Western Canada's exports are currently headed to the Midwest, which is at capacity for heavy oil. But Gulf Coast refineries can process over 2 million bbl/day of heavy crude, far less than the estimated 350,000 bbl/day currently being supplied. Construction of Keystone XL could bring that number up over 1 million bbl/day, further displacing heavy oil imports from Venezuela and Mexico. Capital expenditures in the oil sands are expected to decline to $15 billion this year down from $17 billion last year and $23 billion in 2015. Spending is still less than half of the $34 billion spent in 2014. CAPP also says that "stringent and costly" government policies and regulation will be a major head-wind to long term growth in Canada's energy sector.